The bridge crossing the dam just after leaving the aid station. Have you ever had a race or a training run after which it left you in a bit of a funk? I’m not talking about what seems to be the somewhat common “post race blues” I see people posting about and hear people on podcasts talking about that occurs after the excitement of the finish has faded. I’m referring to a race experience that felt like something was missing from the start to the finish and although it for some reason feels incomplete, as many times as you replay the experience back through your head searching for that missing piece you just can’t seem to identify what it was that was missing. The deeper and more thoroughly you search you realize that there was nothing lacking with the course, the aid stations, or the organization of the race. You realize that the lacking piece was an internal factor, your interpretation of the experience and your outlook and attitude leading up to, during, and after the experience. 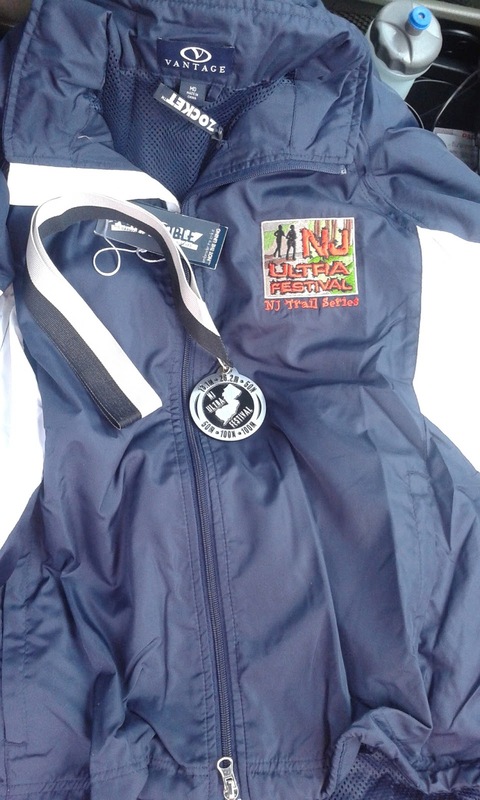 I am not proud of it, but I am willing to admit that this was the conclusion that I came to after the process of searching and analyzing that I went through following the 2017 NJ Ultra Festival 50K. The view of the falls overflowing from the dam. 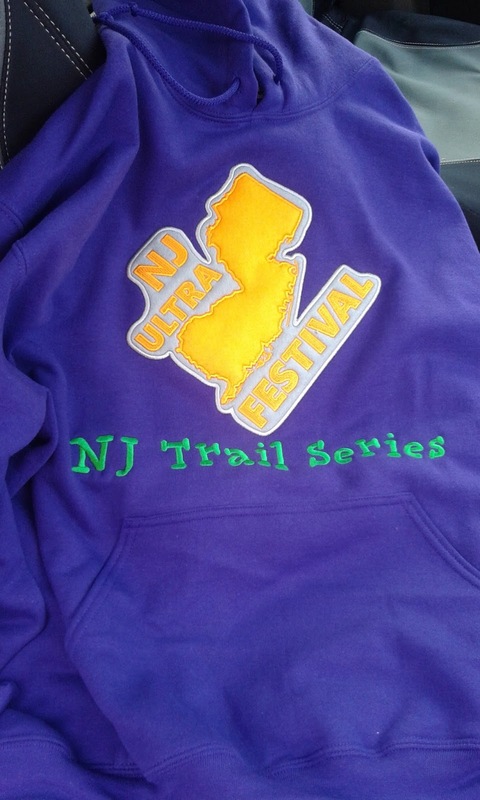 The 2017 Ultra Festival is a multi distance event put on by NJ Trail Series. The distances offered include half marathon, marathon, 50K, 50 mile, 100K, and 100 mile. Something for everyone, right? 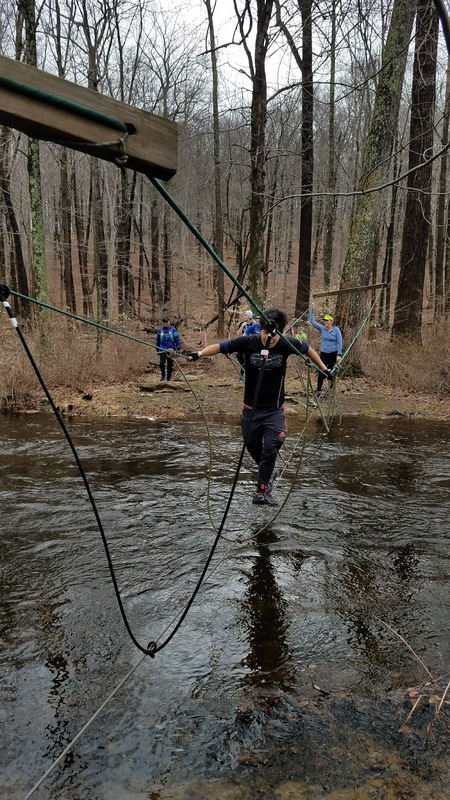 The 2017 race took place on April 1st at the Princeton Blairstown Center in Hardwick, NJ. 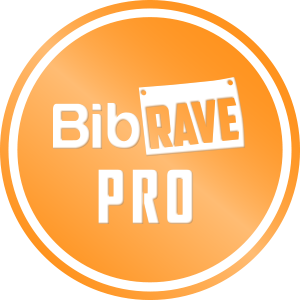 The course consists of two loops which both start and end at the race headquarters which also acts as the solo aid station. The two loops were referred to as the forest loop and the lake loop. Respectively, the distances of the two loops according to my Garmin were 3.1 and 2.25 miles making each lap about 5.35 miles long. 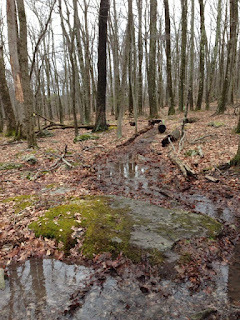 The 50K distance consisted of 5 full laps and an additional lake loop which my Garmin recorded as a total distance of 28.99 miles with 4200 feet of elevation gain, the majority of which was on the forest loop as the lake loop is relatively flat. 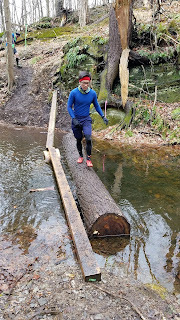 I signed up the Ultra Festival 50K because the timing and terrain seemed to be perfect for a final long training run before the Hyner 50K, the first of the three “A” races (PA Triple Crown Series) I had planned for 2017. It was three weeks out from the Hyner giving me plenty of time to recover and taper. 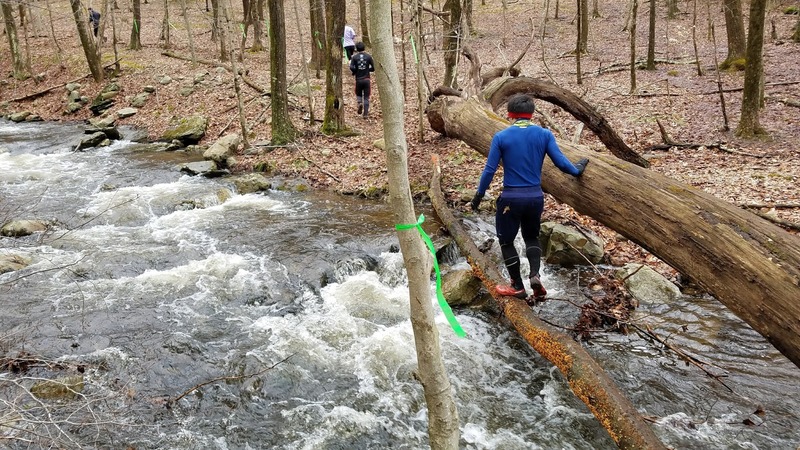 Little did I know at the time, but the weather and trail conditions of the Ultra Festival 50K would be the best possible training conditions to prepare for the Hyner. Looking back, this mindset of going into a race as a training run may have been part of or nearly all of the reason why I felt that something was lacking when the run was over. 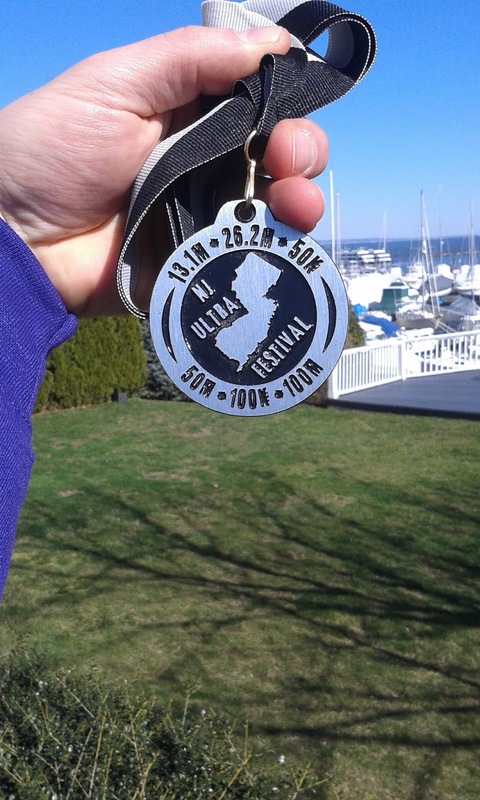 Every other ultra I’ve run has always been a test to see what I can do. There have been plenty of times where I have fallen short of my goals in a race, but even in those situations when I realize my top goal is no longer feasible I have continued to push myself to reach the goal at the next tier down. With this race, it felt like I gave up when my “A” goal of a sub five hour finish began to slip out of reach. 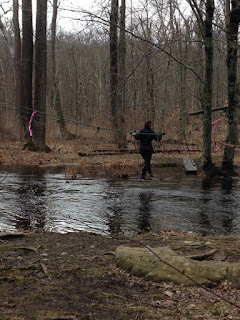 The first water crossing of the forest loop. 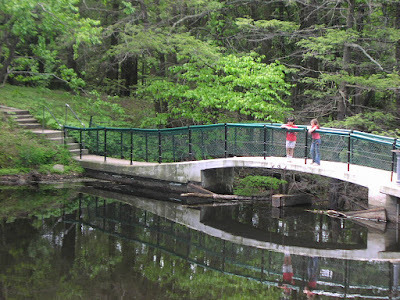 The second water crossing of the forest loop. 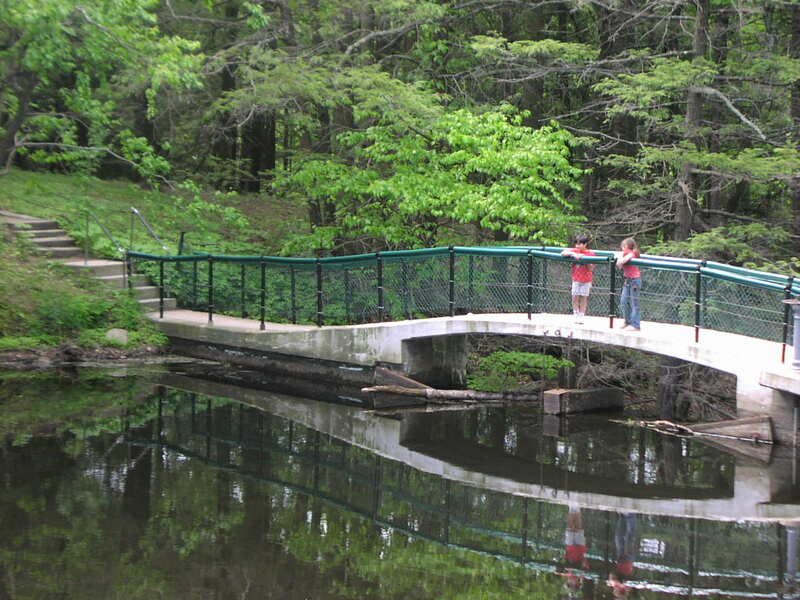 The wooden bridge near the end of the forest loop. a half mile descent before reaching the first water crossing. 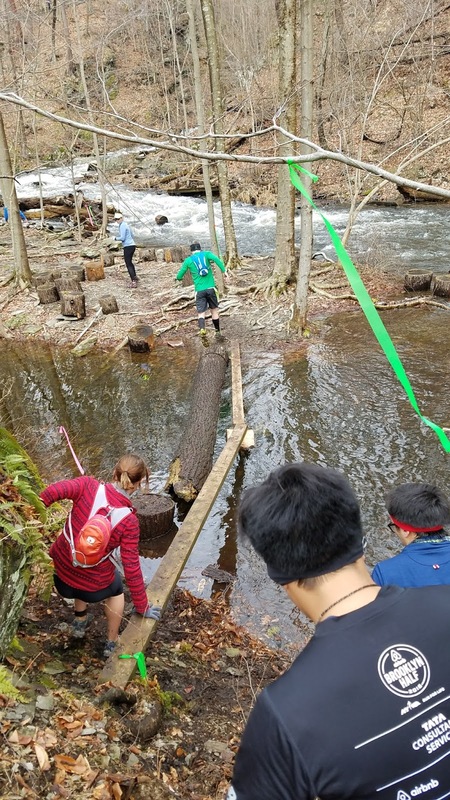 This crossing had a downed tree with high and low limbs across it which you could walk across and use for balance to avoid getting wet feet relatively easily. 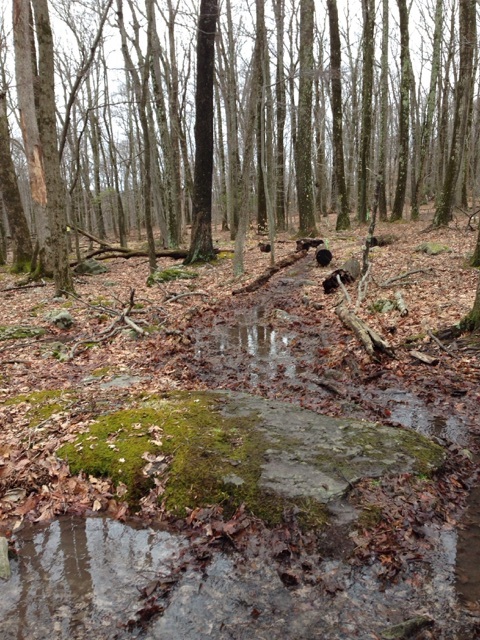 However, given the trail conditions it did little good to keep your feet dry at the water crossings. Following this came one of the muckiest sections of the trail and the biggest climb of the course. Water was actually flowing down the trail in sections as I climbed the next half mile up with a little over 200 feet of gain. 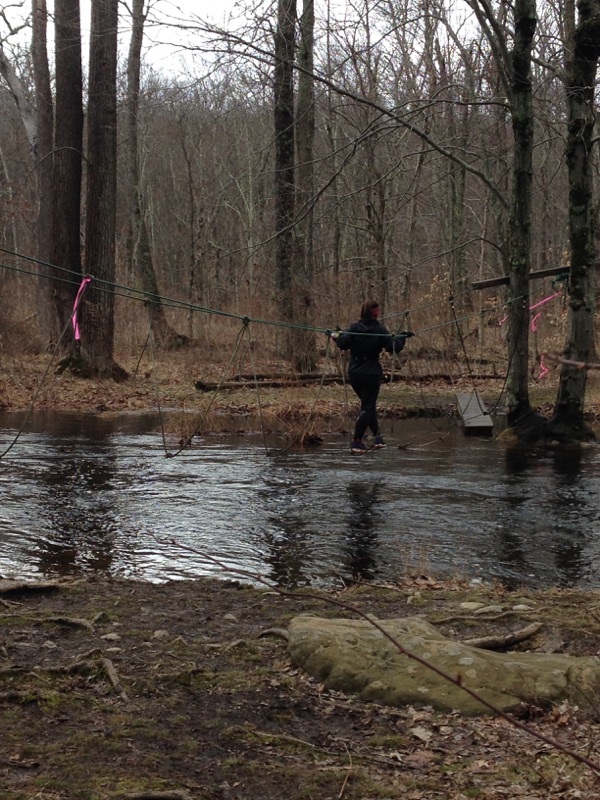 Then it was about a half mile descent back down to the water for the second water crossing. 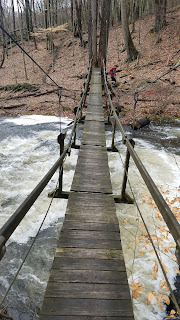 This crossing had what appeared to be a slick, narrow limb that you could balance on to cross, but I opted to walk through the knee deep water rather than risk slipping and taking a bad landing in the water. By this point my feet weren’t getting any more wet. This was followed by another sloppy, half mile climb before a quick descent to a wooden bridge crossing the water. The trail then followed along side the water for a short run before the final water crossing of the loop. After this there was a short but steep climb during which we were treated to a view of the falls where the overflow from the dam is released to feed the stream we had just crossed several times during the forest loop before making it back to the aid station. The final water crossing for both loops. It was at this first aid station stop that I met another runner who asked me if I was racing this. It was still early in the race (about 3 miles) and I was still well within reach of my 5 hour time goal so my response was simply a “yeah, kinda…”. He headed out from the aid station as I was filling my bottle. Shortly after I started out for my first time around the lake loop. 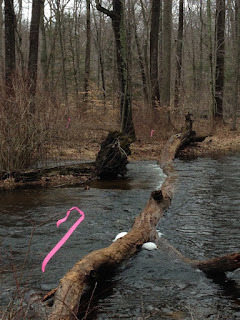 The lake loop was flat compared to the forest loop. It likely would have nearly all been pretty fast and runnable if conditions were decent, but on this day it had basically become a mudfest. Conditions had become sloppy and slick causing my pace to slow. 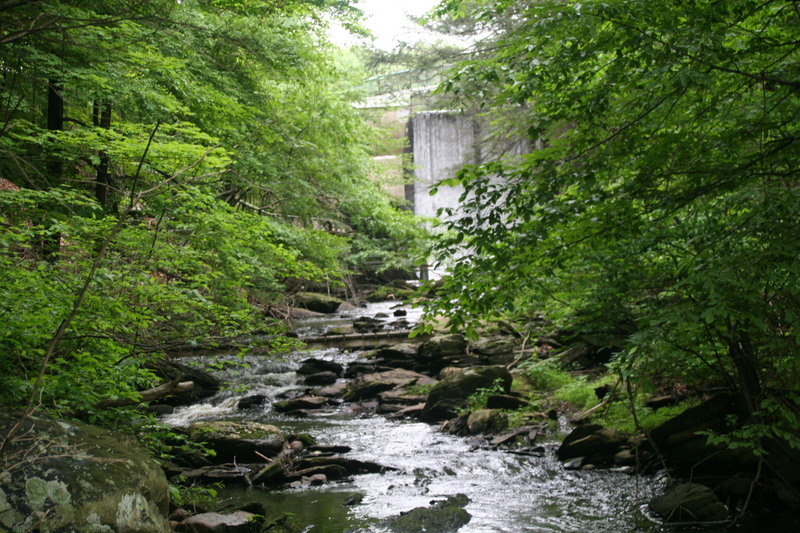 The loop follows the east side of the lake from the dam crossing. At about a half mile from the dam the lake ends and the trail crosses the stream that feeds the lake. This crossing had a few options for getting across. 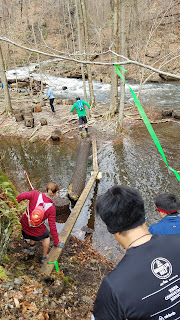 There was a rope bridge or a fallen log that could be used to cross. The rope bridge seemed to always have a line at it and the water level was high enough to flow over the log so that option wouldn’t do much good to keep your feet dry. Dry feet, however, had become a lost cause altogether. 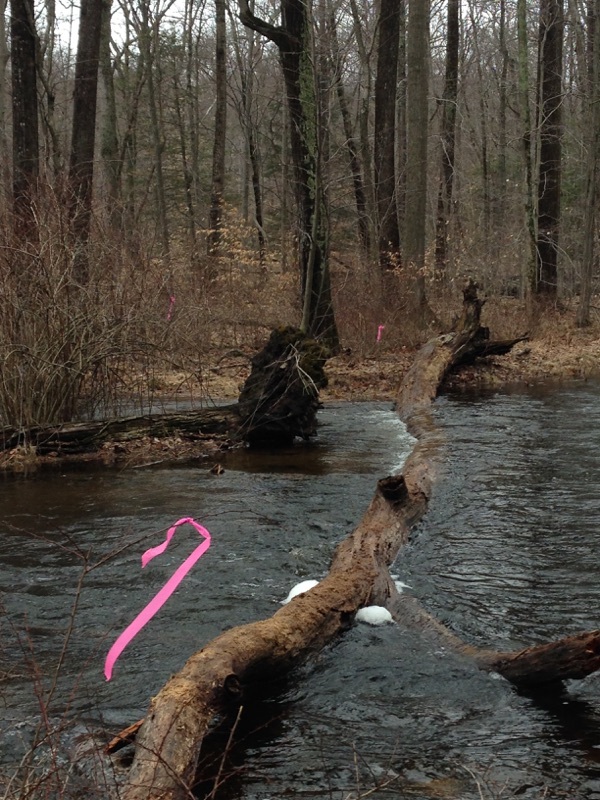 I simply used the log for balance as I waded through the waist deep stream. 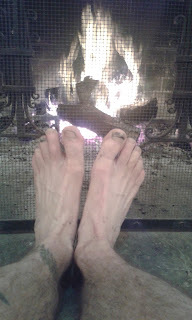 And wow, that water was chilly, but it felt good to wash all the mud and grit off my legs. The trail then followed the west side of the lake back towards the aid station. 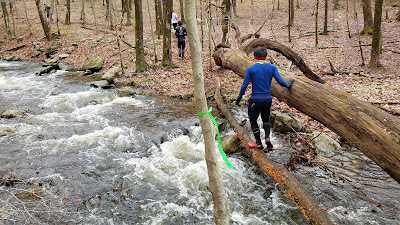 Just when you near the aid station, the course cuts away and heads back into the woods for about a 1 mile loop where the trail merges with the end of the forest loop trail just after the bridge crossing and before the final water crossing. I spent the majority of the lake loop with the runner I had just met at the aid station and one other runner. After grabbing some food and refilling my bottle I headed back out for lap 2 alone. Another view of the rope bridge. 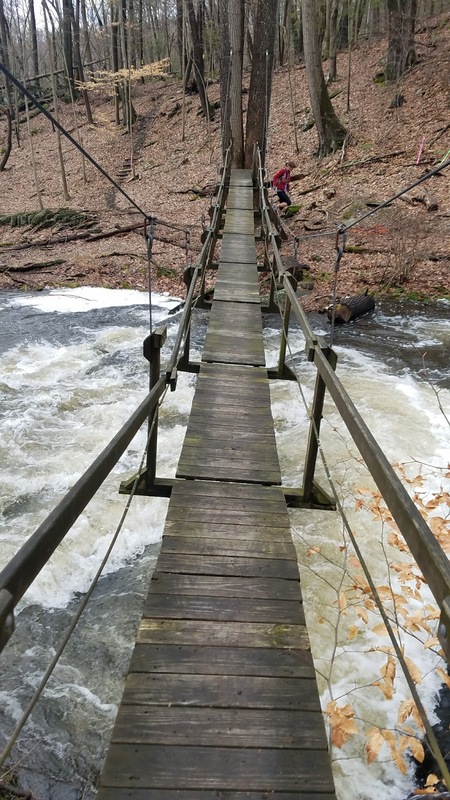 The rope bridge crossing option. Lap 1 had taken me just under 1 hour to finish. I knew I would have to move faster to meet my goal as I had a lake loop to do after 5 full laps. I could blame it on the conditions of the day or the fact that I hadn’t trained on hills much leading up to the race, but my target time slipped farther out of reach as I ticked the miles off. At the end of lap 2 my total time was just over 2 hours. At the end of lap 3 my total time was just a little further over 3 hours. 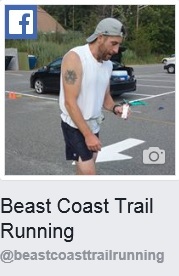 It was during lap 3 that I was so desperate to shave a little time off that I urinated in my shorts. It wasn’t as bad as it initially sounds. During the deepest water crossing of the lake loop, which was about waist deep for me, I let it flow while wading across. The flowing water washed away the urine as it was released keeping me relatively clean and not smelling like urine while saving the time it would have taken me to hop off the trail to go. Even with this completely ingenious tactic, rather than gaining on my time goal, it was getting farther out of reach with every lap. Now just a little past the halfway point, I was beginning to accept the fact that today was not going to go as I had hoped. At the end of the forest loop during lap 4 around the 19 mile mark I was about 3 hours and 51 minutes into the race, well behind my target pace with almost no chance of catching up to my target time. It was at this point that I met up again with the other runner who had asked me about racing the event. I hadn’t seen him since the end of lap 1 and this time he asked if I wanted to run the rest of the race together. Having just realized that my goal time was completely out of reach I was feeling a bit defeated and not competitive at all. I said yes thinking it would be nice to have some company for the last few loops and take my mind off of what I was currently viewing as a failed race. I had the singular time goal for this race and if I didn’t reach that my only secondary goal was to get a good training run with some hills. With this mindset and my goal time a lost cause, I did not have any motivation to push myself harder to compete for a higher placing at the finish. Even considering the fact that as we left the aid station for the second half of our fourth lap we now shared the lead. The muckiness of the trails was impressive. We had some conversation during the lake loop and I explained how earlier I had been aiming for a time goal that was now an impossibility. We finished the loop at a comfortable pace without either of us pushing the other. It was during the forest loop of our next and final lap that another runner caught up with us. She past me and was on the heels of the guy I had been running with during the first big climb of the loop. I watched as they both climbed hard and eventually out of sight while my legs and my mind refused to push. It was like the shoe sucking mud I had been running through all day had sucked the will out of me as well. It was towards the end of the forest loop that I caught back up to the guy I had been running with. We basically picked up our plan to finish the run out together once first place was out of both of our sights. So together we ran the last 2 lake loops and finished at the same time about 16 minutes behind the first place finisher. feeling disappointed about it and just a bit empty. After examining the how and why I was feeling this way I came to a few conclusions. The first being that maybe I’m a bit more competitive than I thought I was. I tell myself and others that I don’t run ultras competitively, but for personal enjoyment. But when I think back to how I felt as first and second place raced up that hill and out of sight while I felt powerless to chase them and I didn’t particularly enjoy it. I ran decently in pretty tough conditions. I thought that I should have been proud of that, but for some reason I wasn’t feeling that way about the run. I ran about a third of the race with the company of another runner. This should have been a positive as well I thought. However, looking back at the day and my finishing time, I kept on asking if I really pushed myself to my limit and the answer I kept getting was no. Maybe part of the reason why I had this feeling after this race and no other race I’ve done is because of a conversation I had with my brother in law a few hours after the finish. He was basically asking how it went and I explained how I finished with one other runner for second place. He immediately asked “How’d you tie?”. I tried to explain that we ran the last 10 miles together then just decided to finish together. Just as a side note and some background info that may clear things up a bit, my brother in law was a competitive trampolinist who competed in the 2012 London Olympics. So even though I may be more competitive than I had thought I was, he may have an even stronger hunger for competition. It was after this conversation that I started questioning my race effort and whether I ran my race or someone else’s race. The more I relived and examined the experience the less happy I was with it. The last ten miles I ran with another runner had benefits for sure, but also negatives. Honestly, it left me with more “what if” questions than I liked. What if I had run the last ten miles alone? What would the outcome have been? Would I have been faster? Would I have been slower? I guess I’ll never know. I’d say the lesson I’m taking away from this race is how important it is to me, for better or for worse, to run my own race. Whether I meet my goals or fail spectacularly, at least I did it on my terms and have no excuse for the results other than the effort I put forth. Most importantly though, I want to enjoy the experience and the memories of it. If I am looking back on any given race and questioning my effort I feel it is somewhat tarnished as a subpar effort, even if I went into it with the mindset of it being a training run. Maybe this is a fault within me that I need to reconcile in some way. For the time being at least, I am recognizing it.